Typical scenario… First date with cute guy = huge pimple appears the day of the date! Learn how to make a pimple vanish in 8 easy steps that will give you amazing results. 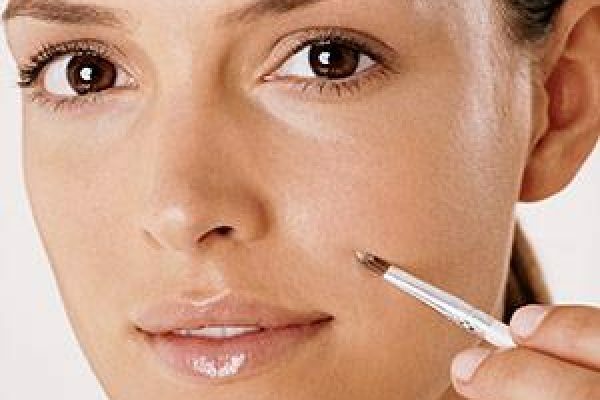 Make-up is a great ally when it comes to dealing with pimples and blemishes, but you have to banish them the “right” way. Bacteria is on pretty much on everything we touch, so you want clean hands when dealing with your face. 2. Cleanse your skin properly. If you suffer from acne or more “than an occasional pimple”, its probably a good idea to use an anti-bacterial facewash regularly to help stop the spreading of bacteria cycle. Apply a natural Toner evenly across your face and pat into the skin. Witchhazel or Rosewater are good choices. Toners help balance your skin pH levels and prepare your skin for make-up. This is an important step that most women skip. Dab a little oil-free moisturiser on the pimple(s). Apply your normal moisturiser to the rest of your face and neck. This might seem a little strange but you want to smooth out the pimple(s) rough surface before you disguise it. After your moisturiser is absorbed, apply a drop of eye drop solution onto the pimple as this will help to remove the redness. Wait for a few minutes for it to absorb. Using a small lip liner brush carefully draw green coloured concealer around the edge of the pimple and then blend it toward the centre. Using your finger to pat into your skin. If you don’t own a green concealer use a foundation or blemish concealer that matches your skin tone exactly. Then blend away any harsh lines. FYI: Never use a concealer that is lighter than your skin tone or it will only highlight your pimples. Wait a few minutes to allow the concealer to settle and then apply your foundation in a dabbing motion with a disposable make up sponge, being careful not to “wipe away” what you have just applied. After the foundation has settled, set it in place by layering a sheer yellow toned powder on top of it with a cotton ball. Wipe off the excess yellow powder – which helps blend the foundation into the skin tone with a brush. Garbage in… garbage out! If you clean up your diet… your skin will clear up because after all, we are what we eat. High glycemic foods such as bread, pasta, cakes, biscuits wreak havoc on your skin. So if you remove them from your diet entirely for 7 days, you should see a minor change. If you can cut them out for 30 days you would definitely see a major improvement in your skin. • A green concealer is your best friend when it comes to disguising a pimple, scarring or anything “red” as it counteracts redness. If you don’t have one invest in one. • During an outbreak DO NOT use any beauty blenders or foundation makeup brushes on your face. Only use disposable makeup sponges to apply your foundation as this will limit the spreading of bacteria around your face. • Any brushes you use to apply your powder or blush thoroughly wash with warm, soapy water so as not to re-infect your face the next time you use the brushes. • To get rid of pimples efficiently add 2-3 tablespoons of wheatgerm into your morning breakky cereal or mid morning yoghurt.